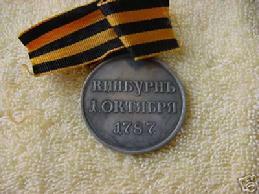 You are looking at a silver medal awarded to all troops who participated in the capture of Kinburn, October 1, 1787. 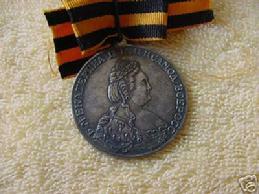 Obverse has the bust of Catherine II facing right surrounded by the inscription, CATHERINE II EMPRESS AND AUTOCRAT OF ALL THE RUSSIAS. Reverse has the inscription, KINBURN OCTOBER 1, 1787. During the Russo-Turkish War of 1787-1791, Kinburn, in Northwest Crimea, was a defensive outpost and on October 1, 1787, General Suvorov decisively defeated a large Turkish landing party there. The control of Kinburn by Russia was of great strategic importance in blocking Turkish communications and shipping in the Crimea and in the soon to be captured Turkish fortress at Ochakoff.